It has been a very busy three weeks for me at Handmade Revolution. A number of orders were made by historical and fantasy author Christian Cameron for some historical reproductions to be worn at a Medieval martial arts tournament in Verona, Italy. I thought it might be interesting to offer a look at the process of making a Medieval knights chain, which was a lot of work but really fun experience all in all. The idea was to create a long chain which could be worn over the shoulders. This was a common piece if medieval jewellery worn by knights of the age. Here's a bit more historical information on that if you are interested. The chain was to be made from square wire, which comes in approximately 12 inch lengths from the smelter. A length of square wire with some grooves in it. The chain needed to be made from rectangular links with crisp corners. To do this, grooves must be cut for each corner with a square file to create the correct 90 degree angle. The file I used to make the grooves. You can see the file that was used. each of it's angles is 90 degrees so it gives the corners the correct angle. I had to be careful to file almost through the metal but not quite, so that the wire would bend but not break. The file was held perpendicular to the wire to cut the grooves. Four grooves were cut for each link. On the last one I would file right through the metal to separate the link from the rest of the wire. The link is bent at each corner. Once the link has been separated, the link is bent at each corner. Because of the imperfections in filing angle, and other issues of human error, the links didn't usually bend into a perfect rectangle right off the bat. Final adjustments to shape were made after the link was soldered. 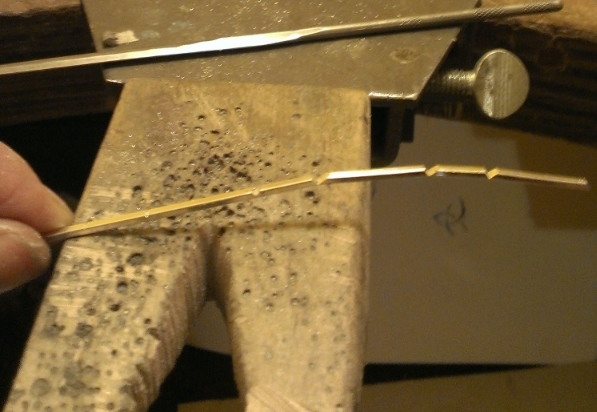 A link bent into shape and ready for soldering. In this photo you can see a link waiting on the soldering block for soldering at three of the corners. One corner must be left open so that it can be attached to the other links. You can see the already assembled chain in the background. Flux is applied to the corners ready to be soldered. This helps the solder to flow nicely into the heated space. The plan is to have solder flow between the two sides of the link so that the corner is nice and strong, Sometimes solder flows to the wrong place and you have to add more. About to flow the solder. Here you can see the flame getting ready to heat the corner and make the solder flow. Different grades of solder are used at this stage and the next stage. A solder with a higher melting temperature is used at this stage and when the links are attached a lower melting point solder is used so that I will not remelt the earlier solder joints. Some links with their corners soldered. After soldering, the links have a black residue on them. This is cleaned off with an acidic chemical solution known as pickle. After removal from the pickle they will be white but not shiny. The final adjustments are made to each link with pliers so the open corner can be closed. Ready for the next round of solder. The chain, not yet closed. Here you can see the chain in process. All the links fully assembled. All the links are finally assembled. There are 64 links in the chain and it is about 47 inches in length. You can see that it is a dull silver. It has to be polished to bring out the shine, but before that, each link must be carefully filed with a flat faced file to remove any excess solder. Each individual link must be polished on the buffing wheel. A compound is used to remove minor surface scratches and bring out the shine. Here it is, all shiny. The last of the compound residue is washed off so you can see the sparkle. it's dirty work! The Mr. Cameron wanted the chain to be gold plated. Sadly real gold was out of the budget, as the materials alone would have cost over $2500. I don't do plating in house, as it involves toxic chemicals which must be handled with the correct sort of equipment to be safe. But the result is a beautiful gold look. In this picture the chain is shown worn over modern clothes, but an image of it worn in its proper historical context will be available soon. All the jewellery assembled and ready to be packed. Here is an image of the chain laid out with some of the other items that were made for this event. Suspended from the chain is an heraldic badge, made in copper, sterling silver, green glass enamel and 10 karat gold. It depicts an 6 pointed spur rowel and a green knotted rope. Moving up you can see a simpler version of a badge made in sterling silver, plated gold. Above that are five silver plated gold heraldic rings with cermit enamel, to be given as prizes in the tournament. Next are handwoven silk garters with sterling silver buckles, and to the left is a ring which was made last year in 10k gold with a green tourmaline cabochon cut gem. It's a lot of bling but medieval people were mad for jewellery so you cant really be too crazy. Hope you enjoyed this educational blog. I wish to discuss craft and craftsmanship as a process, an experience and a creative medium. I hope this will be of interest to craftspeople and non-craftspeople alike. I also want to talk a little about why I believe that high-quality handmade items are inherently more valuable than machine made things. This might get a little bit philosophical, so prepare yourself. I hope you will forgive the use of the gendered term craftsmanship in this blog entry. Please understand that I use it out of convenience rather than a belief that women are any less craftspeople than men. This would be a particularly odd belief for me to have since I and all of the artisans listed on my website are, for no particular reason, women, but I just wanted to make a note of this for all you gendered language enthusiasts out there. One of the things I love about craft is its unforgiving nature. There is really no getting around the fact that it is possible to miscut a garment so badly that it simply won't fit, and all you can do is break it down for scraps or doll clothes. You can also break a valuable gem that you are trying to set into three useless pieces, leaving you to curse the darkness and then go pay lots of money for a new gem. The point I am making here is that there is a fairly hard line as to whether something hand made is successful or not. As you develop an understanding of your chosen craft, it should become more and more difficult to lie to yourself about whether or not you have succeeded. This is one of the challenges that I love about working with the physical world. There is very little room for self-deception, and if you are making things for paying clients, there even less room for the deception of others. If a garment doesn't fit, there is no way that you are going to be able to convince a customer that it is still worth paying for, no matter how much time you spent on it and how much of a pain it might have been to make. This is becoming less and less true in a lot of other industries, and I am not suggesting that such a black and white results system is the only valid way to make a living, but it definitely appeals to me. This is a fundamental part of the experience of craftsmanship. It's just you and the $80 per yard silk, or you and the $1,000 emerald and maybe the fast approaching deadline. High risk, but also high reward. The other side of this, is the tremendous satisfaction in making something that someone else can use successfully. I have always found a great joy when I see a customer happily wearing something I have made, whether it be a wedding ring, or a piece of historical fashion, it is a splendid validation. I always feel a certain connection to people I craft for, even if they are paying clients who I will only meet once or twice. It is a good feeling to know that people are wearing things you have made next to their skin and using them to represent themselves to the world. It is an oddly intimate sort of relationship and one which I take very seriously. Another aspect of craft that resonates for me, is the connection with the past. I am somewhat of a student of history, and I take great pleasure in recreating the garments and jewellery of the past. I am regularly stunned by the skill level and commitment that went into basic everyday items in almost any period of history before the modern day, and it fills me with sadness to think how many of those skills sets we are losing or have already lost. Nowadays we put our energy into different things, some of which are commendable, some, such as Facebook, much less so. But I think it is deplorable that time which would have once been spent sewing next years clothes, learning to embroider, or perhaps carving a new chair, now goes into playing Farmville and Tweeting. It's important to understand that there were serious professionals in the clothing industry. In the 18th century for example there was a massive guild dedicated to embroidery, but it is equally important to understand that for your average lower income farm dweller, if you wanted something embroidered, you damn well got the nearest woman to do it for you. Without the many distractions with which we are now surrounded, people had to fill the time, and what better way to do that, then in making something useful and beautiful. As I have mentioned earlier, there is great experiential reward available in making something, even if there is not going to be any economic gain, and I think we allow ourselves to abandon these pursuits at a great costs to individual satisfaction. There is certainly a movement towards craft today, but it is hanging by threads if you will. I know many hobby knitters and crocheters, but very few people who sew for fun, and almost no one who regularly make their own garments for everyday wear. Why is that you ask? There are a number of reasons. Making your own garments is really hard. It takes dedication, time, trial and error, skill and equipment to come up with a garment you are not ashamed to wear on the street. It can be incredibly hard to motivate oneself to do something like this, when Game of Thrones is on and you really need to muck out the cowshed on Farmville or whatever it is people do in that game. The other side of this is that a jacket from H and M is only $125... and you can just buy a new one next season when you get bored of this one. If you can't see all the things that are wrong with this picture I am frankly surprised you have made it this far in my ... rant? Why do we choose easy over difficult? Perhaps it is just because we can. One of the big drives of modernization has definitely been convenience, and thanks to technology and outsourcing we have that in spades,. But do we really want to be part of a culture that discourages us from attempting to do difficult things with concrete results? Until fairly recently, only the very wealthy - could afford to have throwaway garments made for special events. Now we regularly buy items we intend to wear only once, after which point they will sit in a closet gathering dust for god knows how long, until we shovel them off to Goodwill, or perhaps a landfill somewhere. People take fine jewellery a bit more seriously, but there is still a massive trade in cheap plastic costume jewellery which will break after three wears and be so much off-gassing landfill waste itself. I hate to use the phrase, consumer culture, but let's face it, we live in one, and the one way I can see around this - is to start taking our purchases more seriously, purchasing things that will last, making lasting things more affordable, and not mindlessly buying new cheap stuff every time we need a little pick-me-up. This has become way longer than I intended but I want to wrap up with a brief note on value. I spoke a little bit in the beginning about the process of craftsmanship from the perspective of the creator. Now I would like to try to convince you, as a potential customer and a thinking human being, that there is a value inherent in handmade things, that simply doesn't exist in something made in a factory. As an artisan, everything I make has a little bit of me in it, a little bit of my soul if you will. And because each handmade thing contains a bit of the artisan, the processes, plus the materials and thought that went into it, a sort of gestalt is reached that you just can't get anywhere else. It may be hard to quantify, but I think it is real, subjectively and experientially, if not quantifiably. I happen to believe that we live experiential lives, and precious things which we love deeply, help to enrich our experience. The process of making something, or of wearing something that someone made by hand, is completely different from the experience of wearing something you bought in a shop, that divorces you totally from the reality of the creation of that thing. If you made it this far, I hope you will take a minute to look around your house, at the things you own, and wear and ask yourself, which are the most valuable to you? Is it about how much you paid? How useful something is? Where you got it? The experiences that you associate with it? Maybe even the connection you share with the person who made it? I think it is worth spending time and money on tangible things, lasting things. I would much rather spend my money on fabric that I can make into a coat for someone I care about, then on another piece of smart plastic which will be useless landfill waste in three years. How about you? Thank you to Nancy Watt for her help with copy editing this document. Any errors remaining are my own. 14K gold rings, engraved with the couples name, pictured after one year of wear. Click to go to Wedding and Engagement. It's a pretty big decision, a wedding ring will be worn every day, maybe for the rest of your life. 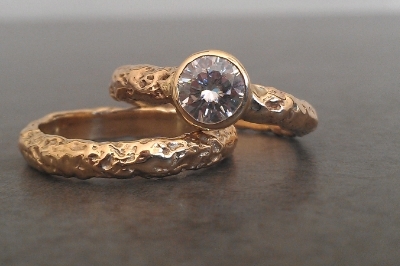 At Handmade Revolution we can't image choosing rings that would be anything less then custom made. It's that personal connection that makes the difference. Years later, when you look at your ring, you want to think of the love shared between you and your partner, and you want to know that the person who made those rings had met you, and was trying as hard as possible to create rings that would symbolize your love in a personal way. Having wedding rings custom made gives you some say in what you get, but more importantly, allows you to engage directly with the process of making your rings. It's a completely different experience from being sold to off the shelf. Mass produced rings have no personality behind them, no loving craftsperson thinking of you and your beloved when they create your ring. A 14K gold wedding and engagement set. Titanium band with 18K gold wire. That's why we offer custom wedding rings, because we know that the difference is huge, and we want our customers to have wedding rings as personal as their love. It's not just about a unique design, it's also about the relationship that you create with the artisan who makes your rings. Your rings will adorn your fingers for many years, it just make sense to have them made by someone you get to meet in person, share some conversation with, and talk to about the ideas you want to capture in your rings. Handmade wedding rings capture a little piece of your relationship, so through the years whenever you look at your rings you will be filled with the tangible reality of the true love you share.